Contains premium organic and wild-crafted: Spruce, Lavender, Geranium, Cedar wood, Orange, Juniper Berry, Blue Tansy, Ylang Ylang, and Rose essential oils. Gratitude™ blend was specifically formulated for the Be Young exclusive program Emotional Aromatic Touch Modality™. 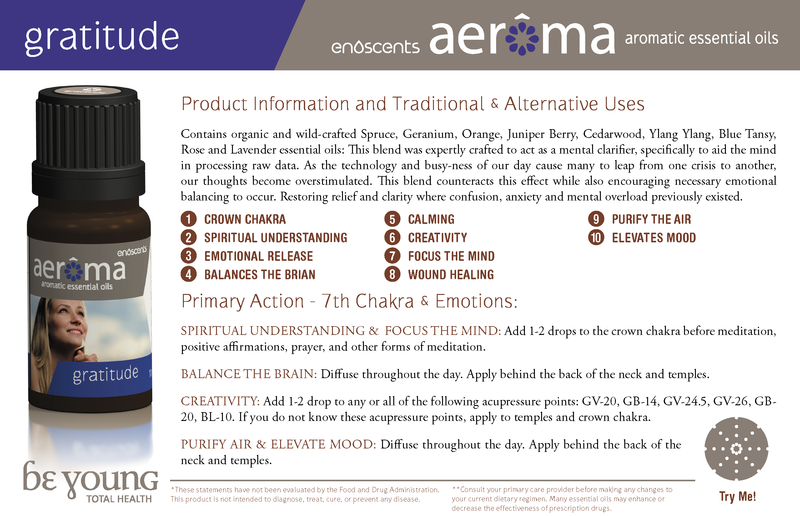 The combination of essential oils included in this blend have a powerful balancing effect on the 7th chakra (Crown). Specifically blended to balance and restore the body's natural ability to regulate energy pathways and emotions including feelings of anger, distrust, grief, or feelings of abandonment. Apply 2-3 drops to the palm of your hands, rub your hands together and inhale for 30-60 seconds. Apply 2-3 drops directly on the crown chakra. Odor: Have characteristic odor resembling rose and geraneol. Great for massage therapist. Apply 1-3 drops to the shoulder to help eliminate negative emotions of others. Apply on the bottom of the feet to children to assist with night terrors.